Surreal CMS is a very simple and straight forward Content Management System, it lets you set pre-defined areas on web pages that can later be edited once they are hosted and live. Surreal CMS requires that you have an account with them in order to login to their service and make changes to your website. It’s also worth noting that they do offer a free 14 day trial. 2. 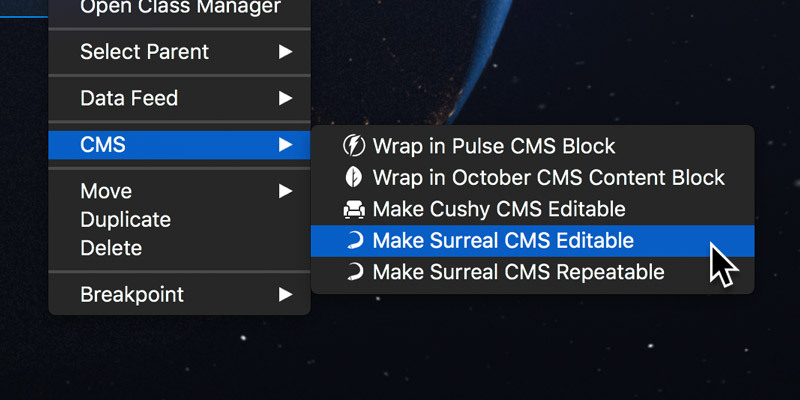 From the CMS menu item located in the context menu, select Make Surreal CMS Editable. This will make the Brics active marker, turn purple, this indicates that it is now set up to be editable with a CMS. Once your site is exported and hosted, you should be able to login to your Surreal CMS account and change the content of this area via the Surreal CMS dashboard. 2. 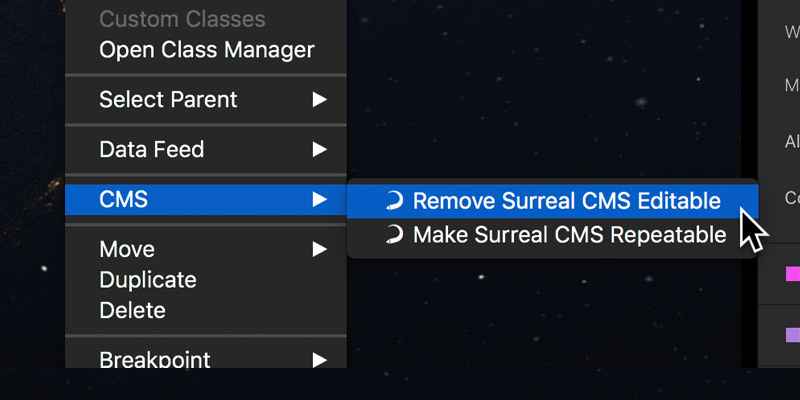 From the CMS menu item in the context menu, select Remove Surreal CMS Editable. You will also need to follow the relevant steps provided by Surreal CMS in order to gain access to your site via the Surreal CMS dashboard. Repeatable Areas are chunks of content that can be repeated, reordered, and deleted. They are particularly useful for things like articles, event listings, navigation menus, or anything else that has a dynamic number of items requiring the same HTML structure. There is no limit to the number of repeatable regions you can have. You can read more about repeatable areas on the Surreal CMS docs.